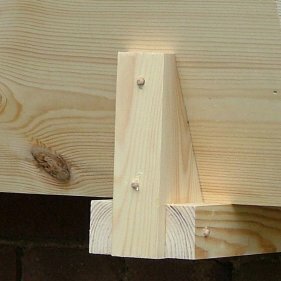 To fit your window boxes, attach the supplied batten to the wall with the supplied screws and rawplugs and then slot the window box onto the batten. See image below. The Bolas window boxes has simple, clean lines that will enhance any window ledge, wall or fence. Shown attached to the wall with a hidden fixing rail that allows simple removal by lifting up and away from the rail - although this is probably a two person operation once the box is filled with soil. 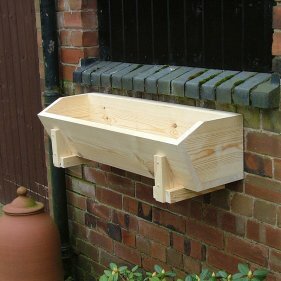 The Bolas window boxes als have two solid saddle timbers underneath that are decorative but can also be used to disguise metal brackets if you prefer to use them rather than our hidden fixing rail. 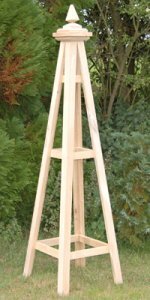 The Bolas Windowbox is constructed from 30mm thick Scandinavian red pine timbers, hand finished with clear, golden brown, wild sage preservative. We also offer a selection of Farrow & Ball paint finishes. A windowbox, sitting snugly on a sill or fixed to the wall beneath a window, offers the chance to change your outlook with every season and to enhance the facade of your home. The most attractive window boxes are often those in which the colours are vibrant and the vigour of the plants creates a swirling mass that obscures the box and almost envelops the window it is dressing. But if you are attaching a window box below a window it is dressing. But if you are attaching a box below a window that opens outwards, be careful to site it low enough, so that you can still open the window when the plants mature. relatively small amount of compost, so they need slow-release fertiliser granules, as well as water-retaining gel or granules incorporated into the mix. Make sure that a window box sited on the front of the house is securely fixed. This will keep it safe from theft and will prevent endangering the people walking beneath it. 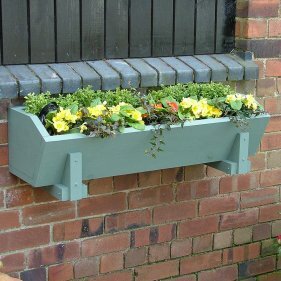 If you live above other people, or if your windowbox overhangs a pavement, it may be a good idea to equip the box with a drip tray: it will be no fun for neighbours to be caught under a shower each time you water the flowers. Try to fix your windowbox into position before you plant it up-it may be impossibility heavy to move later. If the box is for a ground floor window it will be easy to work on it from the outside. But if you live higher up, you may need to throw the windows wide open and work from inside.